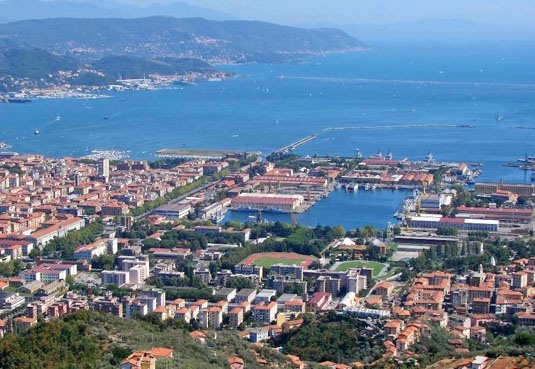 La Spezia is a city of many identities, and therefore offers many differing but interesting itineraries for tourism. The monument that best represents it is its castle, Castello di S. Giorgio, now the home of the museum, Museo Civico Formentini. Inside you can find the famous statue-steles of the Lunigiana area, anthropomorphic monoliths of the Bronze Age and the Iron Age, and a great collection of Roman and Medieval material. Next comes a shopping street, Via del Prione, which also holds the ancient Oratory of S. Bernardino – today housing the Civic Museum of Ethnography and Anthropology, with a fascinating collection of artifacts from the nearby Lunigiana area. On the same street is the Diocesan Museum. The Museum of Seals, in the Palazzina delle Arti, has more than 1500 seals of all ages. Another museum, Museo Amedeo Lia, located in the 17th century convent, San Francesco da Paola, has collections of antique jewelry, miniatures, Tuscan paintings for the 1300s and 1400s, a vast number of small bronzes, a “wonder chamber” with refined objects in rock crystal, coral, and semi-precious stones, and an art collection with works by Bellini, Pontormo, Tiziano, Tintoretto, Veronese, and Canaletto. The latest museum to be created in La Spezia is the modern art CAMeC, Centro di Arte Moderna e Contemporanea, on Piazza Battisti. Based on the Cozzani and Battolini donations, other works were added during the years 1949-65, the winners of the art award “Premio del Golfo”, instituted in 1933 by Marinetti. La Spezia also has a sea promenade, which leads to excursion boats that can take you for a tour of the Gulf of the Poets, and the navy Arsenale which is a masterpiece of military engineering. Next to it lies the Naval Museum with a fascinating collection of beautiful figureheads, artifacts from the battle of Lepanto, from polar expeditions, and 12,000 other items relating to the sea, including models of ancient and modern ships. Futurist architecture can be admired in Piazza Verdi, in the Palazzo delle Poste e Telecomunicazioni, and the clock tower, Torre dell’Orologio, covered in mosaics by Prampolini e Fillia. In the old city, restaurants and taverns offer traditional dishes from Spezian cuisine, like “mesciüa”, a soup based on chick peas, cannellini beans, farro and grain, garnished with pepper and olive oil. Or stuffed or fried locally harvested mussels. The great ancient boat race, the Palio del Golfo is held on the first Sunday of August, with 13 historic boats competing, one for each quarter of the city. The “Festival Internazionale del Jazz” is the appointment of the month in July and has been for the last 40 years. La Spezia leads on to the mouth of the Magra River, Bocca di Magra, a tourist harbor on the estuary which is part of the River Park. Here you can go bird-watching, canoeing, kayaking, and rafting, or simply walk or cycle down its extended system of paths. Don’t miss Montemarcello, whose stone profile dominates the skyline from on high, on the Promontorio del Caprione, in one of the most interesting natural areas of Liguria. The village is still partly surrounded by an ancient fortified wall. Ameglia is another town that preserves its typical characteristics as a medieval village. Its back to back tall houses climb up the hillside to the castle, whose round tower and fortification walls remind us that this was the Palace-Castle of the warrior Bishop of Luni. Modern day visitors climb up to it through a labyrinth of alleyways with sudden panoramic views onto the Magra. Hidden among the stone houses are restaurants with a rich gastronomic tradition. The Val di Vara is interesting. Its most important town is Varese Ligure which can be reached by following a route that crosses streams, woods, and stone villages perched on green hills. Rural villages, where it is a pleasure to stop in the excellent little restaurants to enjoy ravioli, cima, and rabbit made in accordance with traditional recipes. Varese Ligure is a lively agricultural and commercial center, with modern tourist facilities. The town itself is composed of two nuclei of differing origins. The first is the XIIIth century “round village”, Borgo Rotondo, a closed circular fortification of colored houses centered on its castle on Piazza Fieschi. In the summer the “Village at the Opera” is held in the castle, adding a musical touch to the imposing 15th Century fortification with its tall defense tower and circular rook. In front of the castle is the Church of Saints Filippo Neri and Teresa d’Avila dating to the 1600s. The new town, Borgo Nuovo dates to the XVI Century and has a linear layout, with noble palaces and the white baroque Church of S. Giovanni Battista. Nearby is the Oratory to Saints Antonio and Rocco, which displays great crucifixes used in processions. Varese Ligure has also obtained some important environmental certification. Its typical local gastronomy products are Porcini mushrooms, chestnuts, and “sciuette”, pastry made with almond dough. At the bottom of the valley, near the highway is Brugnato. It has an interesting old town with the Church of the Saints Pietro, Lorenzo and Colombano and its Diocesan Museum. Worth seeing is its Corpus Domini festival where flowers cover the street to create a kilometer-long carpet of sacred symbols in colorful petals. In Brugnato, and in nearby Borghetto Vara, rafting is very popular, with important rafting races done here.